“This daylong event brings together the campus and community around multi-modal and active transportation. Great event at UMD! Speakers, Musicians, Dancers, Performance Art, Paintings, Photographs, Sculptures, Food, Coffee, and PRINTING! Calvin holding the poster he printed. The bike as auxiliary percussion. One exhibitor seemed to be getting more traffic than the rest at UMD’s Fall 2014 Sustainability Fair — Justin Anderson ’16, who was an anomaly among his green-thinking neighbors. Flanked by vendors on either side, Anderson demonstrated his Pedal Power Press. 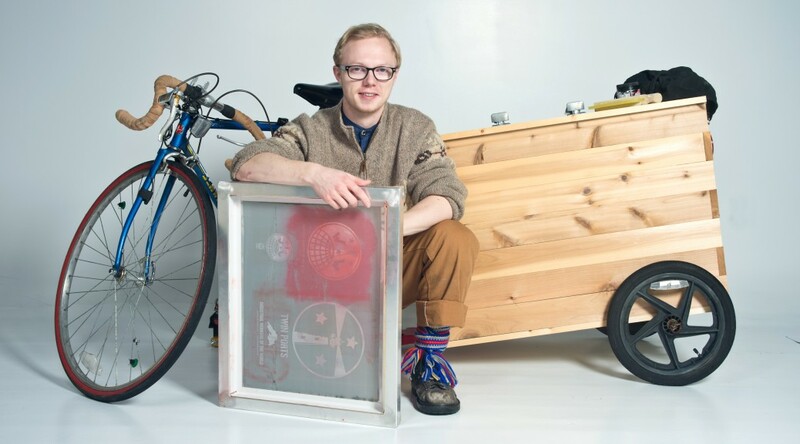 As the name would suggest, his creation is a screen printer fastened to the back of a bike. It’s an attention getter with a purpose. It’s also a practical way to pursue two passions. “The idea is to make it not dependent on fossil fuels. You simultaneously promote a culture of sustainability and a bike culture,” he explained. That pragmatism drives other decisions in Anderson’s life. His major, for example, shifted from civil engineering to studio arts when he decided he needed to continue to create with his hands, something he’s been doing all his life. The name Pedal Power Press is added to the screen press on the back of the bicycle. With his classroom on wheels, the Pedal Power Press’ reach is limitless. GIVING: Support the work of students like Justin Anderson by making a gift to the Geraldine Hanson Heller Scholarship – 2495. LINKS: This BRIDGE issue is all about sustainability, from alumni and student stories to campus initiatives. See these highlights: Chancellor Black’s message, UMD’s sustainable agriculture project, and $14 million in sustainability research projects.